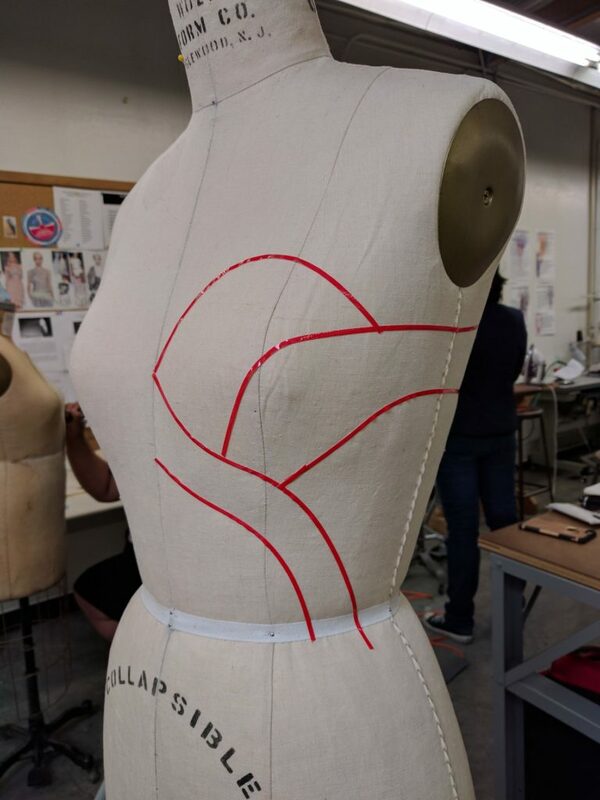 Once the style lines are established, individual pieces of fabric are pinned to the form along the seam lines. 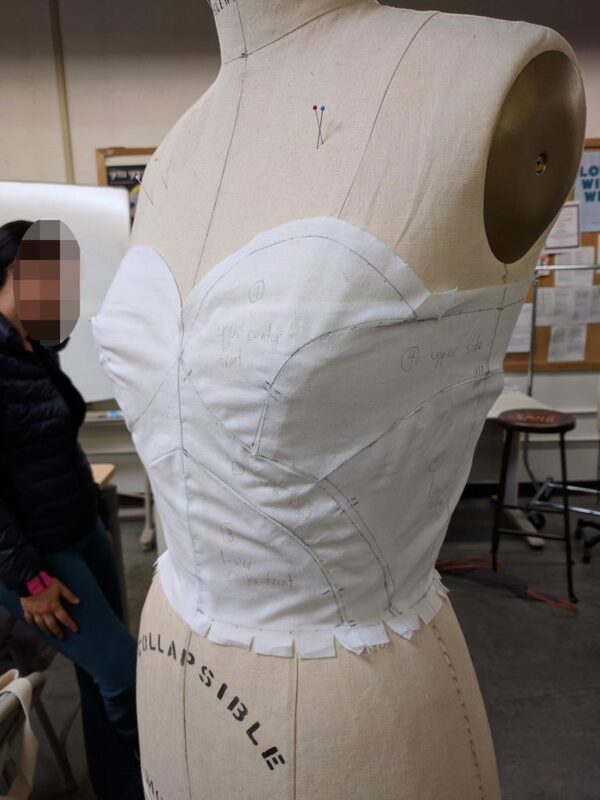 Each piece of fabric has to be carefully checked to make sure the grainline of the fabric lines up parallel to center front and center back on the form, in order for the bustier to shape correctly. 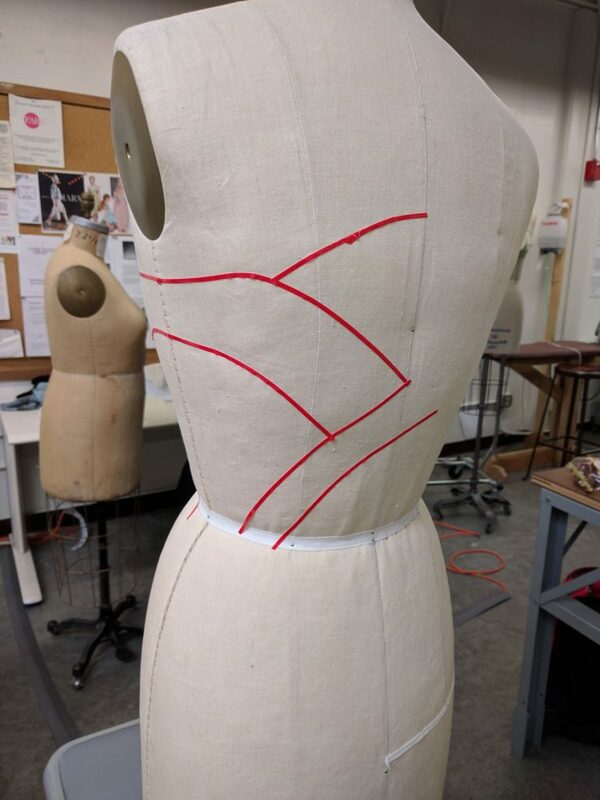 Unless the design is asymmetrical, we only drape one side of the dress form to guarantee the same look on both sides of the finished garment. All fabric pieces are removed from the form and transferred to paper to make a pattern. My pattern had eight pieces. All of the seams have to be trued, grain lines drawn, and seam allowances added. 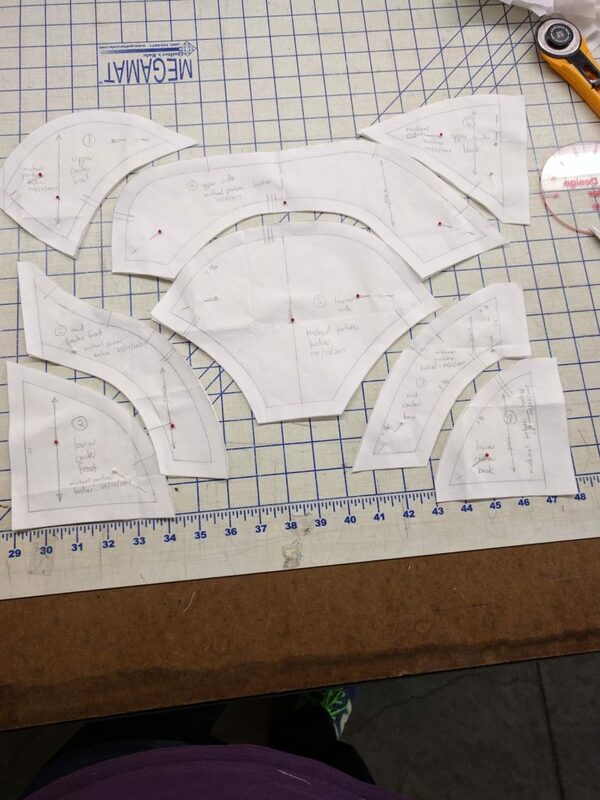 Importantly, matching pieces are numbered, labeled and notched to make it clear to a production person how the pieces are assembled into a garment. The trued pattern must be verified for fit. 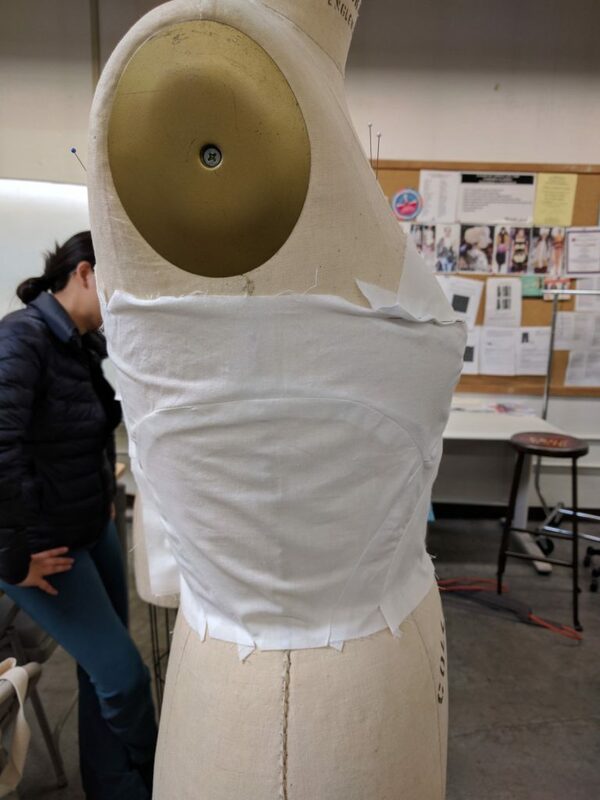 So I cut out a set of pieces from muslin fabric , then basted together a trial bustier to be placed back on the dress form for evaluation – and in my case, a letter grade. (We also submit the paper pattern to be graded). 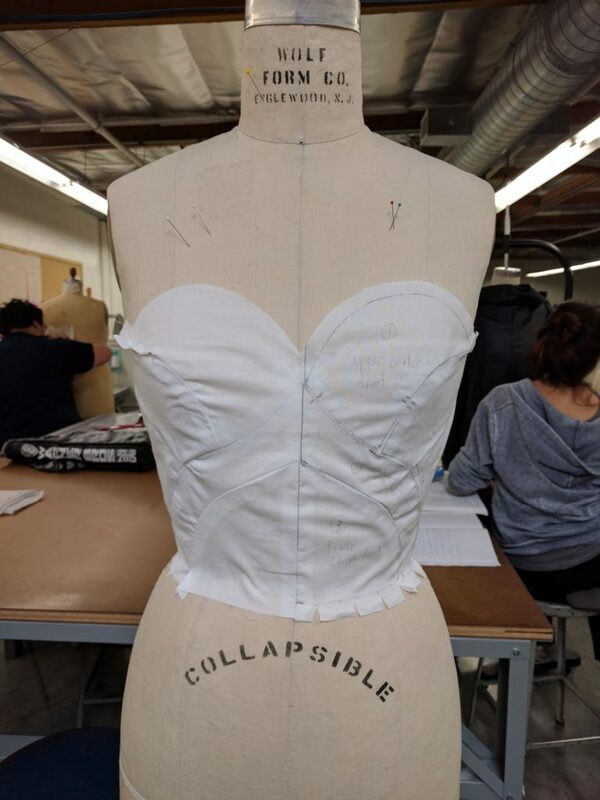 This bustier had a total of 16 seams, all of which involved sewing opposing curves and in some cases multiple seams meeting at the same point. 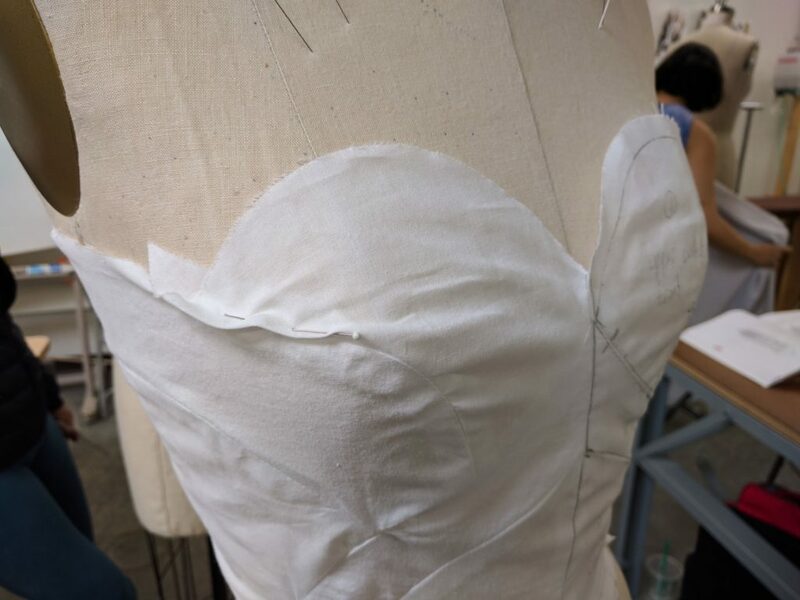 From attempting to sew the pattern, I learned pretty quickly those meetup points required extra notches on the pattern in order to inform how the sewing should go. I also made a paper mockup of the pattern to verify that the notching was unambiguous. The verdict? Not bad for a first attempt. There is some gaping at the top of the cup for the bust; the instructor pinned out the excess as you can see below. Had I staystitched the pieces before assembly, the gaping would have been reduced, but the error is mainly in the pattern. The instructor warned me about this and suggested adjustment before I transferred the pattern to paper. I tried pinning it out on the form but wasn’t successful, so I stuck with my initial drape and the error was confirmed by the trial muslin. I did get recognition from the instructor for taking on a challenging (for me) design. 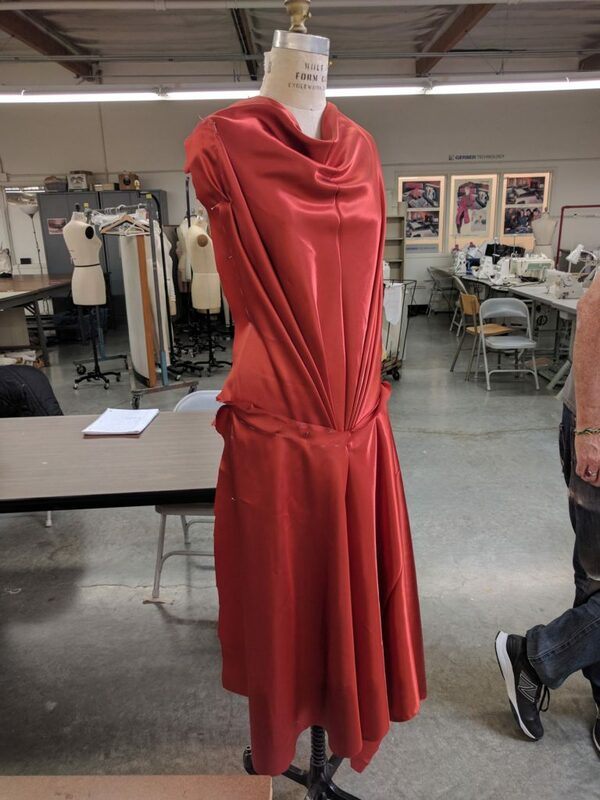 Our most recent assignment was to drape a bias dress. We learned how fabric behaves on the bias, as well as how to mark the bias and work with it on the dress form. One key point about working with fabric on bias is that bias is not symmetrical. On woven fabrics, the crossgrain typically has more give than the lengthwise grain, because the lengthwise grain is held taut during weaving. When you turn the fabric diagonally, one side of the dressform (where the crosswise grain dominates) will have more give and play than the side with the lengthwise grain. Therefore, bias designs inherently do not behave symmetrically. You can either embrace this fact and work with it, or put a seam down the front of the garment so you can have the same grain and drape on both sides of the garment. Another point about bias designs is the fabric on the bias stretches over time due to gravity. 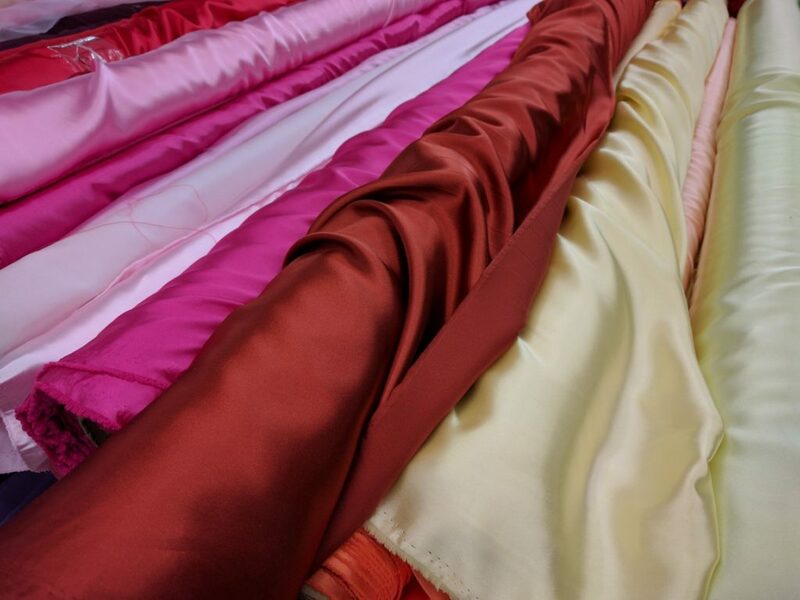 After draping a bias design, you should wait at least 24 hours before cutting hems, to allow the fabric to settle. Otherwise you can get uneven, droopy hems. Our assignment was to create an original bias design on the form. We were encouraged to shop for a fabric that is nicer than muslin, yet is still cheap enough that we can afford to chop up and waste if necessary. I found this rust colored poly satin at Fabric Outlet. This is not a color I normally gravitate towards, but inspiration was at work. I am a fountain pen user and collector, and a friend recently gifted me a bottle of ink whose color is named “Canyon Rust.” Here’s a writing sample. So the ink color, in the back of my mind, called attention to this bolt of fabric on the shelf. I ended up creating this dress design. My instructor, who also teaches fashion history, tells me it is reminiscent of 1930’s style. I marked the right-hand side of the form (from the form’s point of view, closest to the camera) as the side for patterning. It features a waist seam at the hip area, to allow for a separate bias drape on the skirt piece. I really liked the way the satin fabric adds to the design; the shimmer and the shadow makes the design more dramatic. Only a final project remains. 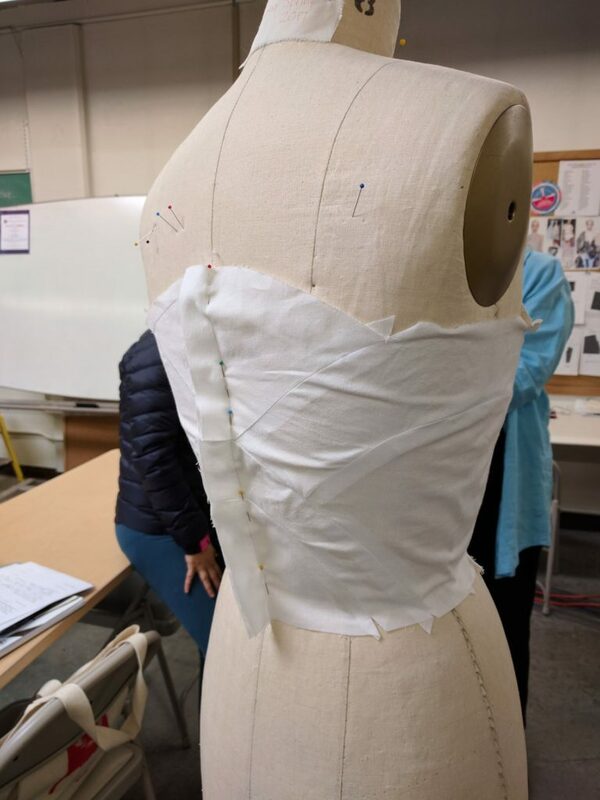 Our task is to make a full-body garment that incorporates the skills we have learned over the semester. The assignment is open-ended, but we are not allowed to repeat work from previous assignments. Additionally, the dress should be a fully wearable garment, including facings, finishings and closures. Though I love the satin look, I didn’t want to repeat myself for this project so I looked for something completely different in terms of fabric. 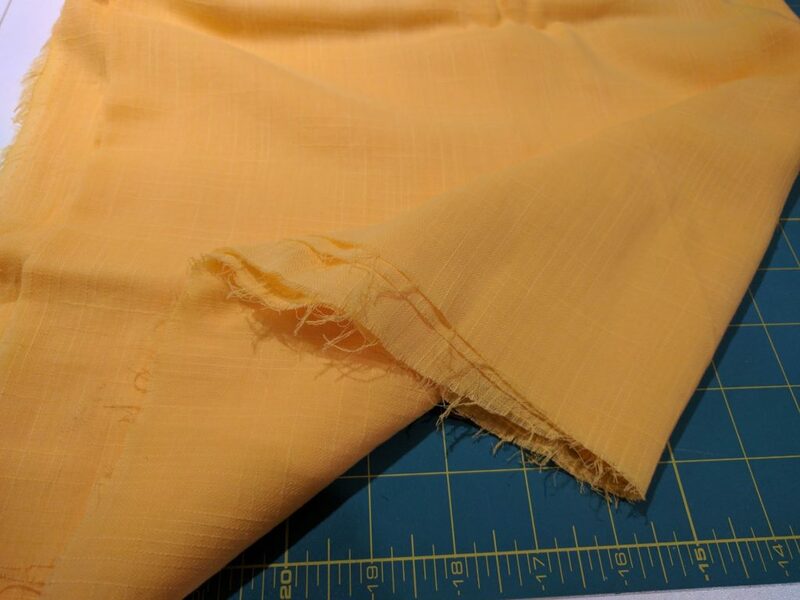 This textured gauzy yellow cotton from Fabrix fits the bill in terms of being unique, but is also quite drapey and looked nice in some tests I did on the form. And being from Fabrix, it checks the “inexpensive” box as well. I don’t have a clear idea what the project will look like yet, but we will have time in class to work on the design. I’ll be sure to share it with you here when it’s finished. A men’s shirt project that has been going on for a while. Enjoyed the bustier, the bias, and the man-blabbing (you came within a whisker of having your card pulled, bub! Ode to that shirt-in-progress…). Eager to see how the gauzy yellow “evolves”. It speaks of something winsome to me (might I suggest you go full on that skirt, or with a billowy sleeve element ? Rumor has it (and there are several regarding you, sir), that there is a cellophane wrapped brick of “fit & flare” in your bag of tricks. Perhaps now is the best time to unwrap and utilize it (merely making a suggestion, with an added double poke from a knowing index finger). Thanks for the suggestions. I drew a couple of sketches and showed them to the instructor. Her comment was, “You like to make things complicated for yourself, don’t you?” She directed me to the simplest design on my sketchpad, saying “I want you to get the assignment done”. She makes sense – there’s only one more class session before the final. I’ve made a project plan and there’s a lot of work to do. That said, the dress will be a “fit and flare” design. The bustier is a great design. I think that it would make a great top to a wedding dress. Thanks! I’ve had suggestions for sewing the bustier in leather and in denim. And yes, it could make a nice wedding dress too!